As a new nation, we have a relatively low exposure to the practice of parliamentary democracy. Moreover after the initial few years of practicing parliamentary democracy since its liberation in 1971, Bangladesh went through serious political instability with the staging of coups and counter-coups. In the process, by the courtesy of military dictators, the form of government was changed to presidential system. Again in the early nineties as the democratic political forces got themselves united and succeeded in their fight against the longest-serving dictator, HM Ershad, holding of a free and fair election under a neutral caretaker government paved way for amending the Constitution to revert to the parliamentary form of government in 1991. But unfortunately the last 13 years of parliamentary democracy fell far short of living up to the public expectation. 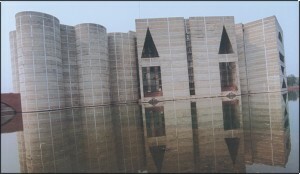 Politicians' lacklustre attitude to parliamentary norms and rules, and frequent session boycotts for one reason or the other made the very important functionary of democracy, the Jatiya Sangsad, most ineffective. Since February 1991, three parliaments 5th, 7th and 8th were elected through popular voting under non-partisan caretaker government system and another short-lived parliament, the 6th one, was elected amidst boycott by all mainstream political parties and very low voters' turnout. Though that mid-February, 1996-poll was held under a party-administration had very little public approval rating, it was, understandably, necessary for bringing in a constitutional amendment provisioning for a permanent system of holding parliamentary polls in regulation time under caretaker administration. Public did not expect much from the 6th parliament, which functioned for less than two weeks and later dissolved with the then prime minister Khaleda Zia standing down from power much ahead of the mandated term amidst an opposition uprising. But the people of the country had great expectations from the 5th, 7th and the current 8th parliaments, which have been elected through fair polls under caretaker administration. Much to the frustration of the general members of the public, our elected representatives in the Jatiya Sangsad largely failed to live up to that public expectation. Political intolerance, confrontational politics and 'winner-takes-all' attitude halted our advancement to the path of a sustained democratic culture. Repeated walkouts, abstentions and permanent House boycotts by the oppositions in all these three parliaments ultimately made the parliamentary affairs all the more dull and non-effective. Treasury Bench-led one-sided discussions in half-empty parliaments did bear no significance for the constituents who sent these lawmakers to the august House with high hopes. Even when both the Treasury and the Opposition benches remained there in these three parliaments they spent more of their energies on eulogising respective party leaders, their late political icons, and debating on non-issues than initiating any constructive discussion on issues of greater public concerns. Mutual misunderstanding and attitude of non-cooperation reached such a height that, in addition to their abstention from the parliament, these days the parliamentary opposition also refrain from participating in the parliamentary standing committees on different ministries. This committee functioning is vital for ensuring accountability and transparency in government activities. It was to the credit of the previous Awami League government that a revolutionary reform was made in the parliament's rules of procedure paving way for non-minister MPs to head these parliamentary standing bodies as chairmen. Ministers are made answerable to respective standing committee chairman and members. Previousely, ministers themselves used to head these committees. But our politicians are not deriving the benefits out of such change towards positive direction as for instance, current main opposition Awami League refrained itself from nominating its lawmakers to these parliamentary committees thereby, giving the ruling alliance men in these committees much leverage. The nation is deprived of getting the benefits of healthy debates both in the parliament and in the committees. It is sad to recall that within three years of 1991 polls, opposition Members of Parliament resigned en masse from the parliament in December 1994 to force new elections, and organised dozens of violent strikes throughout the end of the regime causing injuries to nation's fragile economy. Following general strikes in September and October 1995, President Abdur Rahman Biswas formally dissolved parliament in November to make way for a general election, but opposition parties refused to participate without the appointment of an impartial caretaker government. The general election went ahead in February 1996, but the opposition boycott, a low voter turnout, and violent incidents undermined the landslide victory of the ruling Bangladesh Nationalist party. President Biswas swore in the caretaker government in April, with all parties promising to cooperate, and scheduled general elections for June. Following a reported coup attempt in May, the June general elections brought the Awami League to power. Then, sadly enough, we witnessed almost a copycat repeat of what AL was doing during BNP-rule, BNP did the same as the 1996 parliamentary polls brought the AL to power after 21 years in opposition. In August 1997, the BNP quit parliament to protest alleged harassment of its workers and a proposed treaty giving India transit rights through Bangladesh. In March 1998, the BNP returned to parliament after the government pledged to enforce parliamentary rules evenly and permit BNP street rallies in Dhaka. But months later the then opposition left the parliament once and for all and did not return to the Jatiya Sangsad till BNP became victorious again in a new parliament elections in 2001. In October 2001, Khaleda Zia became prime minister again after her BNP-led four-party coalition won a landslide victory - 209 seats in a 300-seat parliament. And then once again a hapless nation is witnessing the same old story unfolding with AL, now in opposition, refraining from joining the very first three sessions of the new parliament. Apparently after recovering from its initial shock of loosing the polls, AL started joining the Jatiya Sangsad from its fourth session but again quit the House from the eighth session. Over six months passed by and the 8th Jatiya Sangsad sat for three more sessions by this time but AL still refrain from attending it. Non-election of a deputy leader of the treasury bench yet after the 8th parliament passed nearly half of its tenure and the ruling party's reluctance to hold meetings of its parliamentary party are testimonies to our politicians indifference to the cause of strengthening the parliamentary democracy. Of late, a government plan to further increase the duration between every two sessions of the parliament came as another shock. The government is contemplating to enhance the gap period from 60 days to 90 days. That means from now on there would be lesser number of Jatiya Sangsad sessions in any given year. This is not how voters of the country expected their elected representatives to act and make the parliament dysfunctional.